Fact 1: Greece has the highest cheese consumption in the world per capita, averaging 27.3 kilograms (60.6 pounds) per person. Fact 2: Remains of cheese have been found in Egyptian tombs over 4000 years old. Fact 3: A farm in Sweden makes moose cheese. 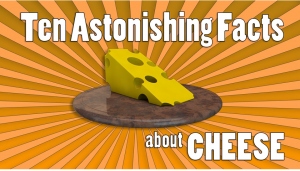 Fact 4: Cheddar is the best-selling cheese in the United States. Fact 5: Cheese develops the optimal flavor and texture when served at room temperature. Fact 6: It takes around 10 liters (2.6 gallons) of milk to make 1 kilogram (2.2 pounds) of hard cheese. Fact 7: The United States is the top producer of cheese in the world. Fact 8: Pizza Hut uses about 140 million kilograms (308,000,000 pounds) of cheese per year. Fact 9: Some cheeses are stored for one year or longer before they are ready to eat. Fact 10: Some ancient Roman houses had a special kitchen, called a careale, just for making cheese. Copyright © 2019 Cheese-A-Palooza. Powered by WordPress. Theme: Spacious by ThemeGrill.